Anybody who doesn't love the title character of this book must have a heart made of stone and covered in riveted steel. She is a fantastic creation: adorable, funny, quirky, and very, very fun to read about. She reminds me of no other kid in middle-grade fiction than Ramona Quimby, which I suppose is quite a compliment as those books were highlights of my childhood reading. 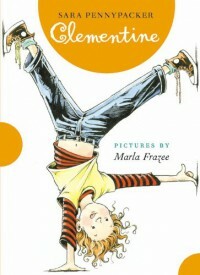 I would definitely have adored this book when I was a kid, but maybe as a near-adult it is even better because I can look back and see the similarities between Clementine and my childhood self. This is a hit with kids and adults alike, and there is a good reason for that: it's perfect for nearly everyone.